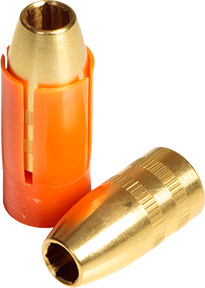 Produced individually on a CNC lathedouble knurled for stability betweenthe bullet and sabot. Optimized ballistic coefficient designto accommodate current twist rates. Each bullet is produced from solidmaterials leaving no voids unliketraditional cast bullets.